I had been looking for a western style holster and belt set for a Ruger Vaquero .357 Magnum at a reasonable price for quite some time. I did an internet search and found westernemporium.com. Their online catalog was quite inclusive. I found a set for the pistol. The shipping charge was reasonable. It arrived in seven days. The fit for me and the pistol was perfect. Quality, price, and value excellent. I will deal with them again. I recommend their products and service. Great products and fantastic service. We thought by the picture it displayed a tie down for the leg. Otherwise very nice. Ordered the wrong size, bought a new one and returned the old one and could not be happier with the turnaround and efficiency of your company. Thank you for a great experience. I wasn't sure if my order would arrive in time for a steampunk event I was attending. I didn't have to worry! The gentlemansemporium.com is super fast at picking and shipping orders. Thank you for your speedy service. I purchased the red bloomers, they're lovely, very well made, beautifully packaged and arrived in a timely manner!! Very happy with the whole process and purchase! Ordered a previous vest and it was the wrong size (my error). Reordered another through the return paperwork to replace previous. New vest looks and fits great (ordered the right size this time). Haven't worn it to an event yet but expect lots of complements. Won't mind telling anyone where it came from! Thanks! I was especially satisfied with the service when I called and reordered some pants. The gentleman I spoke with was very kind and helpful! Hat is perfect, exactly like in picture. I would suggest going the next size up. It was suggested I exchange and customer service was very nice and helpful but we figured for a one time wearing we would deal with the size. The blouse is perfect and fits like a dream. I wanted a 1892 look for a book signing at Bridgewater State University. The coat & tie that I purchased were spot-on. All comments were positive. 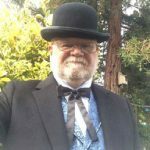 My book, 'Cold Case to Cased Closed ~Lizbeth Borden~ My Story was well received and my persona of a 1890's gentlemen certainly helped set the theme. Thank you for your prompt service and attention to detail. I found customer service personnel very helpful and courteous... I received many complements on the blouse and belt. Sizing was good. My only negative was finding I needed to iron the blouse after it was washed...nice fabric, but not permanent press. I'll do business again with Gentlemans Emporium. Our transaction was quick and smooth, my order arrived quickly and I am 100% satisfied with the Trousers.